There is an odd linguistic curiosity of history that I believe has gone unnoticed. The historian Suetonius tells us that in his day, Julius Caesar used to brand his belongings with the logo “Veni, vidi, vici.” You may not recognize it in its original form, but you know its translation: I came, I saw, I conquered. You recognize it, of course, because it’s what we all say when we leave Farrell’s. Here’s the odd coincidence, unplanned anywhere except perhaps in the mind of God. When Jesus came on the scene, he said, “I am the way and the truth and the life.” When that phrase made it into Latin, the language of Caesar, the three key words translated: via, veritas, vita. It stands as a stark rival alliteration. I ponder these two men, both hailed as gods after their deaths, both leaving behind epitaphs of a sort. The similarity between the two claims is enough to catch the eye, and the weight of their difference is enough to pressure the conscience. We can choose to live lives in which we conquer, in which we prove ourselves, in which we triumph. Or we can follow in the way of the one who taught us that life is what you get when you follow the way to the truth. One lay down roads to conquer an empire. The other became a road for tired travelers in search of a peaceful kingdom. It strikes me that we must choose one or the other epitaph for ourselves. We are either conquerors, or we are followers on the Way (Acts 9:2). Between those two men, one of them now has over 2 billion living followers, and countless more from throughout history. The other has a nice plaque on the ground in Rome. I found this article online saying that Christians misunderstand and misuse Jesus’ statement, “I am the way, the truth, and the life.” Later I got to thinking of Julius Caesar’s “Veni, vidi, vici” and how Jesus’ trio of words would contrast. I knew that in Spanish it would be “via, verdad, vida” and that the Latin translation would be close. 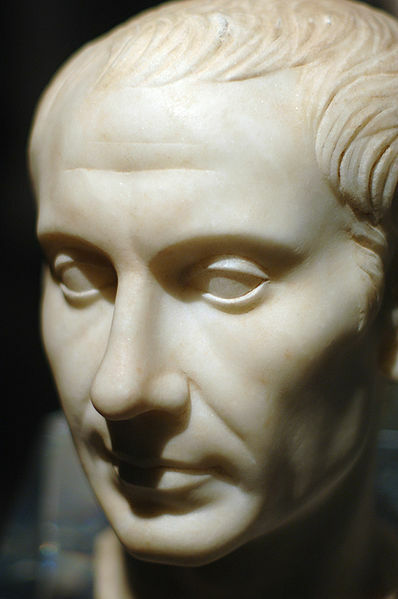 I figure that Jesus and his contemporaries would have known about Caesar’s words and would see the contrast in Jesus’ words–even if Jesus hadn’t spoken those words in Latin. The article dealing with Jesus’ words is “It’s a Big, Big House” by Mark Sandlin, on the Jericho Books website. BTW, I wrote a note on my Facebook page about the contrast of the two groups of words: “‘Veni, vidi, vici’ does not equal ‘via, veritas, vita'”. One of those men has his own salad.